Been exploring a bit with loosening up from some of the more realistic still life painting. I painted the one below in a class last week and it was pretty loose and I felt maybe too loose, not sure if it actually read as mums, so the next day I tried again and came up with the version above. Still playing around with different places on the continuum from loose to specific and what balance I want to strike. Will continue to share my explorations and learnings. Here's a quick study I did today, #3 in my European Escapes series based on photo's from my trips to France and Italy. It's fresh off the easel, so sorry of a bit of a glare on the canvas. This was one from the July workshop I taught in France. When we got there the sunflowers weren't out yet, but by the end of the week they were blooming like crazy. Here are some other photo's of the fields which seem to go on forever. This painting is one of a pair of paintings I recently did for a commission of a garden of hydrangeas around a sunlit urn. I find I prefer painting scenes with lots of sun because I like the dramatic shadows that the sun creates. This summer I've been doing a lot of study and reading on color and light. 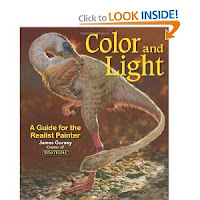 I came across an excellent book by artist James Gurney that just happened to be titled "Color and Light". It's available on Amazon for about $16 and is well worth it. I'm only about 1/2 way thru it, but I'd have to say it's one of the more comprehensive and clear books on the subject that I have come across. It's easy to understand in terms of both words and visuals to help demonstrate concepts of how and why light and color work the way they do. I'd recommend it for any artist who wants to paint realistically. Thank you James for sharing your learning and years of experience to help other artist to grow! 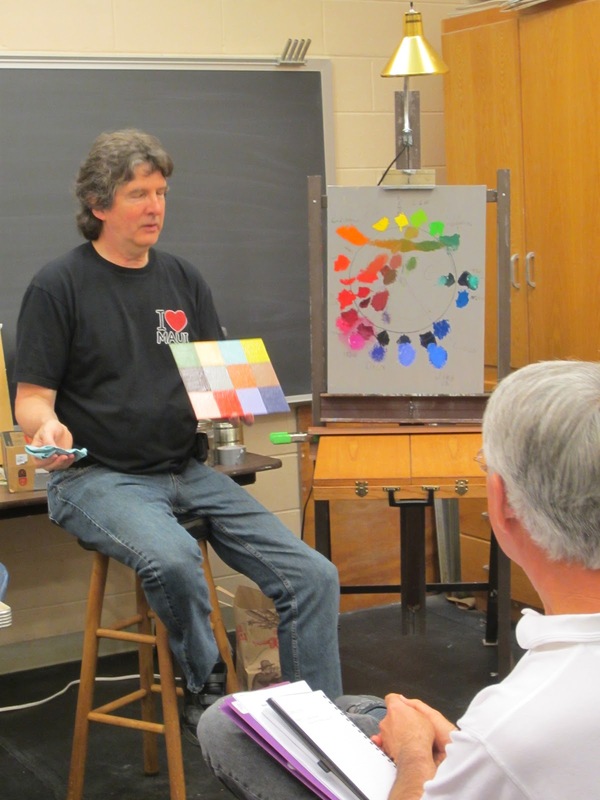 "Education is not the filling of a pail but the lighting of a fire"
Just got back from teaching a fun 2 day workshop on painting landscapes at The Bascom Center for the Arts in Highlands, NC. The Bascom is a beautiful facility that I have been teaching at for several years and I'll be returning in May and August of 2013. I had an enthusiastic bunch of students who were willing to step out of their comfort zone and try some new approaches to landscape elements. I love the opening quote above by WB Yeats. I try to remain true to this as an instructor and not only provide information and "how to's" but also to encourage students to free themselves from the judgment of the little voices of self- doubt that sometimes show up in our head. That self criticism can really impede learning because we can be preoccupied listening to that voice and feeling bad or discouraged instead of being open and receptive to what we might learn. I hope this week I have "lit the fire" for a few more students, opening up the door to the passion and magic of painting. 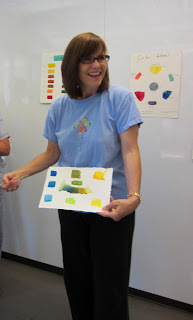 It is an amazing thing that we can place colors and shapes of paint on paper or canvas and that can become something- a piece of art that connects with someone else and gives us joy in the process. Practiced painting skies, mountains, trees and water. Yes, blue and yellow make green, but which blue and which yellow? More on the vast array of different greens that we can mix, not only blues and yellows, but also by warming up thalo green with the other warmer colors we have on our palettes. Have you ever made a lollipop tree? Guilty, as charged. Hope everyone had fun and learned a lot! This is the last study I completed in the Mastering Color workshop I attended last week led by artist Thomas Nash. If you have been following my posts you can see Thomas had us start with simple blocks, then move to more complex shapes including rounded shapes and cylinders and finally even more complex shapes that we might encounter in a still life set up. Even though this felt more like a true painting than a study, the aim was the same, to keep our attention on seeing subtle color relationships. Here's another study done at the Mastering Color workshop I attended this past week led by artist Thomas Nash. All week we were working on both improving our observational skills to see color and our understanding of paint and color so that we could then mix the color we observed. The point of these block studies is to simplify the forms we are working with and focus our attention on color relationships. Thomas is best known as a portrait artist. 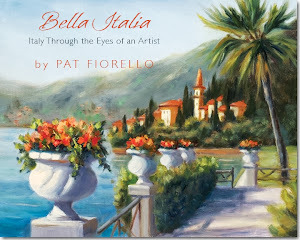 In his 40+ years of painting, he has amassed a wealth of knowledge. One of the things I really appreciate about him is that he has "done the work" necessary to achieve a level of excellence in art. He has intensively studied color by experimenting. He is like an Olympic athlete when it comes to art- he has put in the hours and practice so that when it comes time to perform, he can do something amazing and make it look easy. And he generously shares his expertise and approaches to learning with his students. He is in demand for his portraits so only teaches on a limited basis so I feel fortunate to have had the opportunity to learn and be inspired by him this week. The experience really reinforced the fact that there are no shortcuts. There is no express lane to excellence. It requires discipline, work, curiosity, being willing to fail, not settling for close enough all in the name of reaching for your best. Thank you Thomas for being a great example of this to inspire us all. This week I'm studying color with Thomas Nash. 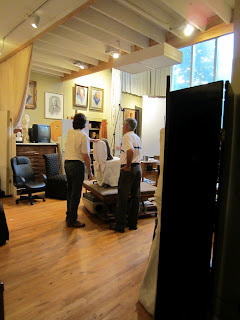 Thomas is a master portrait artist who has been doing portraits for close to 40 years. 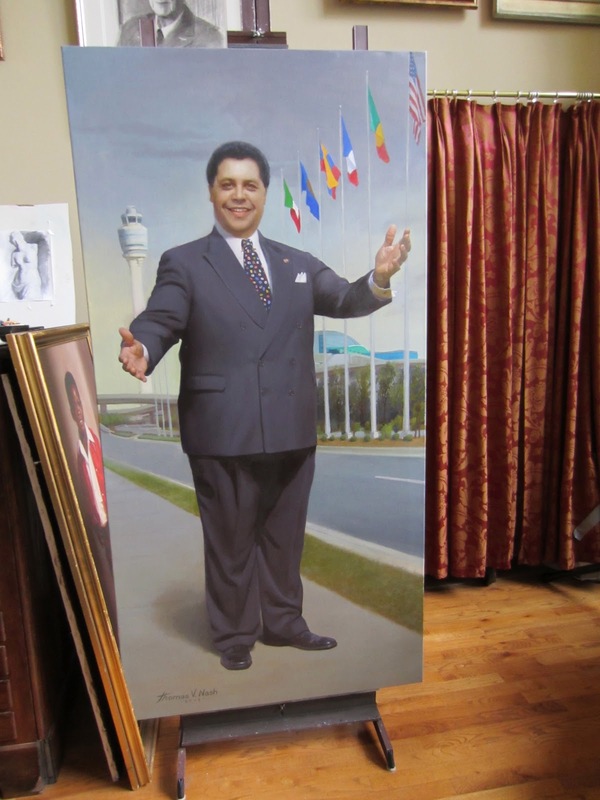 Some of his more prominent clients include Newt Gingrich, GA Governor Zell Miller and he recently complete a posthumous portrait of past Atlanta mayor Maynard Jackson for the new International terminal at the Atlanta airport. While I don't do portraits and am not really that interested in figure work, I do respect his expertise in color. Thomas studied with Henry Hensche, disciple of Charles Hawthorne from the Cape Cod School of Art. I saw Thomas give a presentation at my local art organization in Atlanta many years ago and was really impressed in the depth he went into to study all of his paints and colors. He really brought a discipline and rigor to understanding color. He shares his expertise once a year during a week long workshop in GA. I wasn't planning to take his course this year, had considered it in the past and always was interested, but the timing was never right. I even had held the flyer from last year and a couple of months ago threw it out thinking I'd never have the time to squeeze in another full week, but last week I happened to see the flyer again and thought- hey why not and rearranged things to be able to participate...and I'm glad I did. We are only in day 2 but I am really enjoying the workshop. There are just a dozen students and the program is half lecture/slides/q&a and half hands on exercises that Thomas has designed from (relatively) simple to increasing in complexity each day. He also looks at color from 4 distinct vantage points: Taste, Physics, Seeing/Observation and Craft (the actual mixing, paint properties and studio habits). We've touched on all 4, but the latter 2 seem to be the main emphasis for this program. Yesterday we did a version of the famous" block exercises". Just painting simple block shapes of different colors under light. The idea is to focus on just one variable- color- and not worry too much about drawing , composition etc.. The point is to see the color and relationships of color hue, value and intensity on each plane change and surface. I have shown my study above with a beginning stage of just establishing beginning color notes and photo reference below. 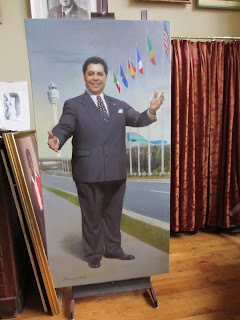 Tom was also gracious to invite the class back to his beautiful studio and home to share his set up, tools of the trade etc..
Tom's portrait of Mayor Maynard Jackson for the new airport terminal in Atlanta. This is the original and a larger giclee is hanging in the airport. Tom ( left) and a fellow student in his studio. He designed it to maximize North light exposure and has options to control direction of the light for portrait sitters with various darkening shades on windows. Very impressive. Here's a painting I completed earlier this year. During one one of my past painting trips to Italy, I spent a day painting at the beautiful Dievole Winery in the heart of the Chianti Region of Tuscany. It's a lovely working winery/resort/restaurant with great painting opportunities of the vistas, vineyards and gardens surrounding the main building. I did a watercolor demonstration of this scene on location which sold while I was there. When I came back, I scaled it up into a larger oil painting shown here. I am looking forward to returning, this time in the fall to teach another workshop. 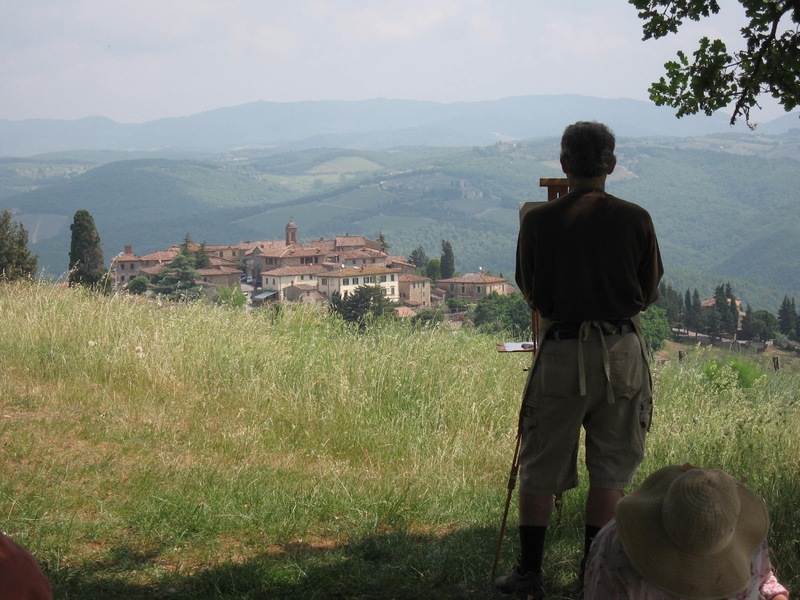 If you've always wanted to visit Tuscany or paint in Europe, please consider joining me for my next workshop in October 2012. The workshop is open to artists of all levels and mediums. And I have even had many people who wanted to learn to paint and used the focus of this trip as a jump start to get immersed on their journey in art. This is my fifth year teaching in Tuscany and each year people come back enriched by wonderful experience with memories to last for a lifetime. 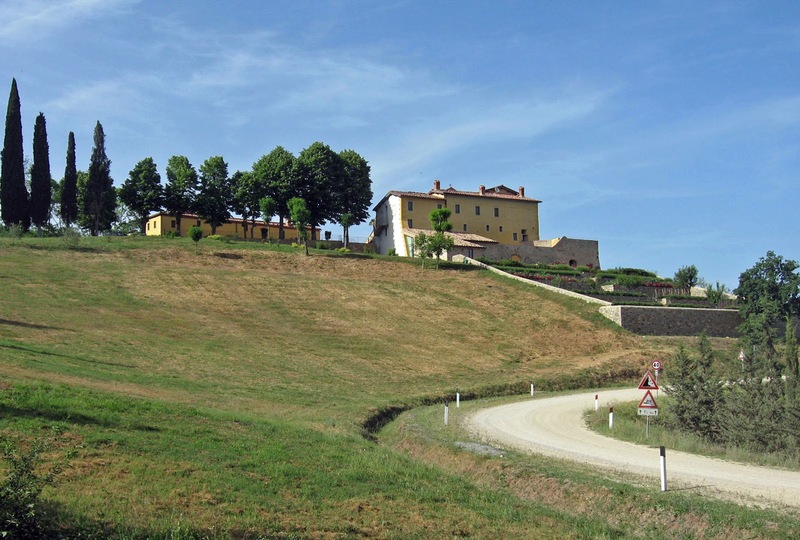 We definitely have time to paint the beautiful Tuscan countryside, but also have plenty of time for sightseeing, photo's enjoying authentic Tuscan cuisine prepared by our chefs and of course plenty of gelato! Click on flyer for more details and on the link for The Tuscan Renaissance Center to see where we stay for our week in Tuscany- a private historic residence of a restored 12th century monastery, not far form Siena- it's a really special place and a wonderful space for creativity and growth. An artist friend was kind enough to save these flowers from her garden for me since she knows I love hydrangeas. I got home late last night but didn't want to miss the opportunity to paint them, so just put together a simple still life and did a "petite" painting 6 x 8 to catch them before they were gone. Now armed with this and photo's I can do a larger version in the future. A good reminder for times when I might not feel I have a big chunk of time to do a larger painting so might opt to skip it altogether to instead do a small study, like I would do plein air, but just in my studio. 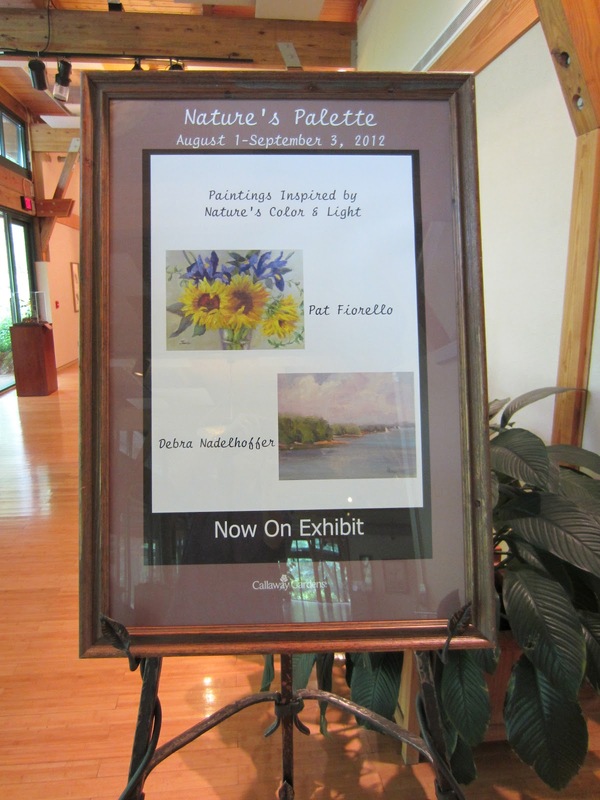 This week the "Nature's Palette" exhibit opened at Callaway Gardens in Pine Mountain, GA. It runs now through September 3. It features about 40 paintings done by fellow artist (and one of my art instructors Deb Nadelhoffer) and me. 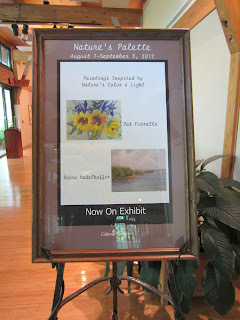 The shows the broad range of colors inspired by nature- Deb's more muted palette of atmospheric landscapes scenes and my more vibrant palette for florals. If you happen to be nearby, please stop in. The show is in the exhibit hall at the Discovery Center. It's a large room so hard to get a comprehensive photo, but these may give you an idea. Yes, this is a detour from my "European Escapes" series. It's a cabin in the U.S., actually our cabin in North GA. This week was my husband Peter's birthday. We love our occasional cabin escapes from the city ( although I'm like Eva Gabor in "Green Acres", for those of you old enough to remember that TV show, the New Yorker in me still likes getting back to "city life" after a few days). I made this painting for him as part of his birthday gift. One of the best parts of painting is to be able to create something special and personal for someone. I love to do that. It's one of my favorite aspects of doing commissions- making something very special that is meaningful to someone. This summer I have 6 commissions that I've been working on in conjunction with the Dunwoody Home Tour. I spend a lot of time photographing the subjects and painting them including small details that are personally meaningful for the homeowners but would probably go unnoticed by other people. These are the homes and gardens of the people who generously open up their homes for the tour which benefits the Dunwoody Women's Club and the good services they provide for the community. After the tour, once the paintings are presented to the homeowners, I'll share some of the paintings along with reference photo's.